conversation with retired Master Sergeant Lee Beckler. Powerful, moving, inspiring. "I’m a damn Marine and haven’t cried in a hundred years." I saw the photo of me sitting on the mat and fell apart for the rest of the day. I couldn’t even comment on the photo. I tried, but I couldn’t. I would just reach over and click “like” on different comments. I’m sure you are wondering what the hell I am talking about and why I am so messed up. My wife was wondering as well. I didn’t know how to explain it to her so I just grabbed my laptop and started typing. Attached is what I ended up with. You brought up demons, ghosts, horrors, and love … so much love. I’m a damn Marine and haven’t cried in a hundred years. This one photo tore me all the way down. I needed this release. Have you ever noticed that when two people look at a piece of art that they usually focus on something different? Abstract art is a great example. You may see a horse running through the woods while another sees a narwhal swimming in the frigid ocean. In this photo, you probably see a man in uniform sitting on a yoga mat in an art studio with a dusty floor. Well, I am that man. Let me tell you what I see. 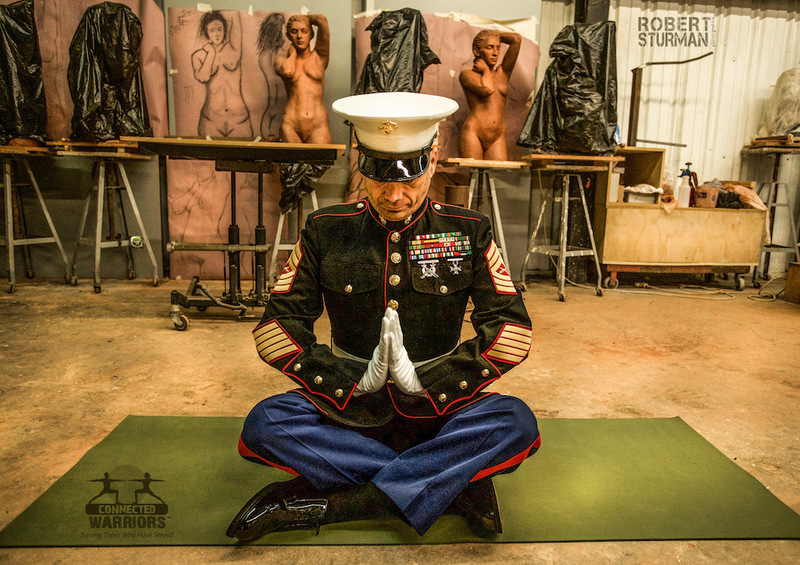 United States Marine, Lee Beckler, founder of one of the most beautiful yoga studios I've had the honor of passing through - Sage Yoga Studios ~ Fallbrook, California.